Call for ... Kimono beauties! Asakusa Aiwafuku is a new-opened Kimono rental store on E-do tori, with the best view of Tokyo sky tree. 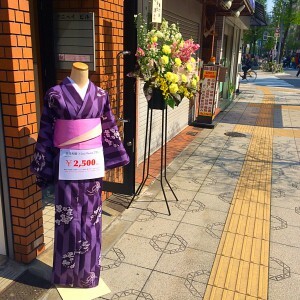 You can experience the traditional culture by wearing Kimono here! 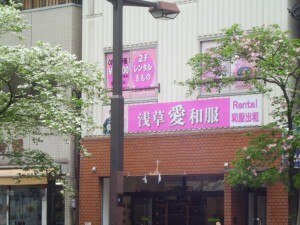 Just 3 minutes walk from Sensoji Temple. Just 3 minutes walk from our shop to Sumida River fireworks venue where you can see Tokyo Sky Tree be the background. Our mission is "Giving love and best memories as a gift!" We offer you an opportunity to experience our love and transform into a Kimono beauty. This is our gift to you! We invite you to try on one of our kimonos and experience the rich culture here in Asakusa, Tokyo! All in WEB reservation new price start! With all hair style+hair ornaments, socks also, the price is included. More than three person, one person is 3,300 yen (including tax).Two sets limited can reserved every day. More information please to see plan page.